As part of this week’s Islam Awareness Week, Hijabi for a Day is about demonstrating the importance of wearing the Hijab for Muslim women. Hijab is a head-covering garment wore by women, to display outwardly their devotion to God. This is part of Islam’s code of modesty, which encompasses all parts of life, including clothing. This is a requirement for both men and women. Wearing hijab is a personal, independent decision to be made by women that is part of a desire to please God and follow Islamic teachings. A common misconception is that women are forced to wear the hijab or wear it to please their husbands. This kind of thinking is not only incorrect, but also demeaning toward women. Finally, Hijab takes women beyond the superficial view of focusing on a women’s looks and instead elevates her status by bringing to attention her individuality and internal value. 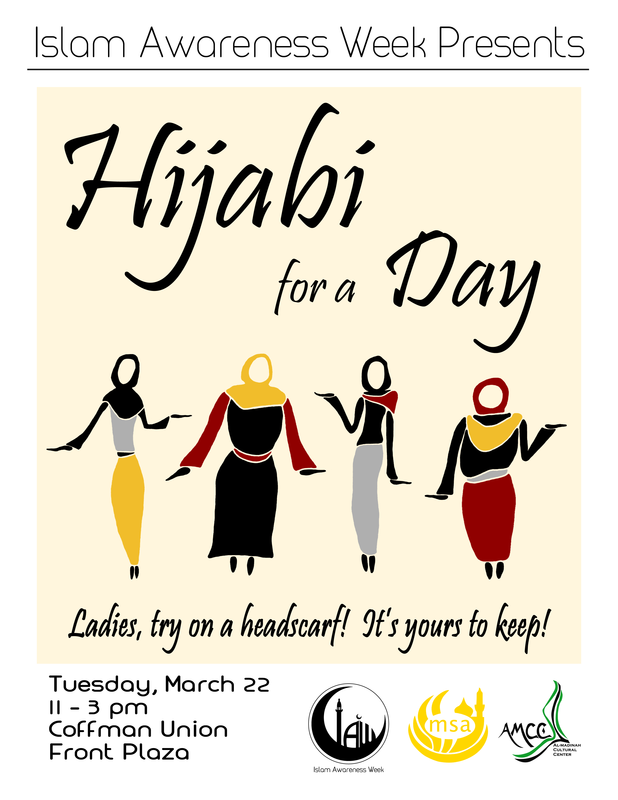 We will be passing out hijabs just outside Coffman on Tuesday, March 22nd starting at 11. We will be showing women how to put them on as well as teaching people the importance of modesty in Islam. Please ask a Muslim woman about why she wears Hijab the next time you see one! Use the use the‪#‎iawumn2k16‬ or the ‪#‎iawTaughtMe‬ hashtags on social media to reflect on IAW!